Preheat oven to 325. Spray a 15-cup bundt pan with non-stick baking spray with flour. Set aside. In a medium bowl combine apples and lemon juice; set aside. In a large bowl, whisk together flour, both sugars, cinnamon, baking soda, salt and ginger. Make a well in the center and add eggs, stirring to combine. Stir in oil. Fold in apples and vanilla. Set aside. Pour half of batter into prepared pan. Spoon cream cheese mixture in big dollops over batter, avoiding edges as best you can. Top with remaining batter and using a knife, pull blade back and forth through batter to swirl cream cheese layer. Smooth top. Bake for 60 to 70 minutes, or until a wooden toothpick inserted near center of cake comes out clean. Let cool on a wire rack for 20 minutes. Remove from pan, and let cool completely. 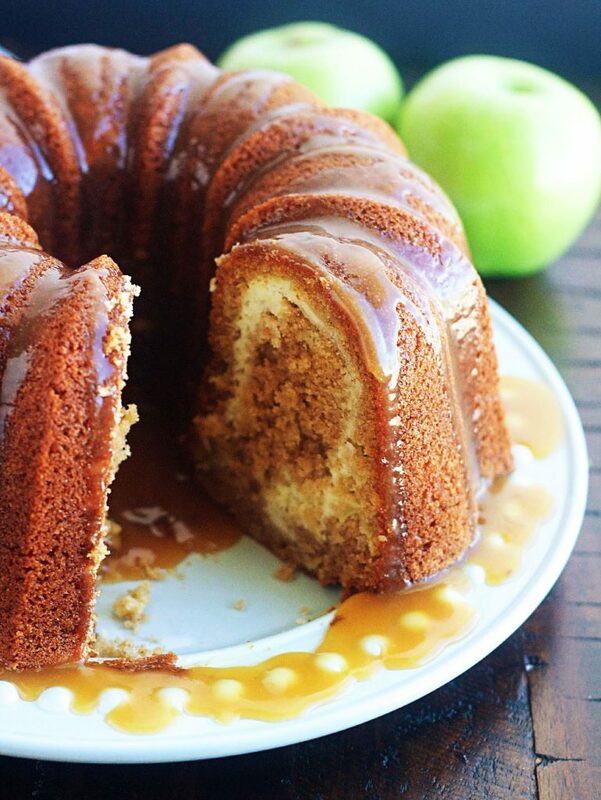 Drizzle cake with caramel sauce and then slice and serve with additional caramel sauce. In a medium saucepan, melt butter over medium/medium-low heat. Add brown sugar and whisk for 1 minute. Add the salt and cream and bring mixture to a boil, stirring constantly. Boil for 4 minutes. Remove from heat and stir in vanilla. Serve warm or at room temperature. This recipe makes a really big/tall cake, so it’s really important you have a large enough bundt pan. Make sure you use a large 15-cup bundt pan or the batter will spill over.